The twenty first century presents a signficantly more complex strategic environment, both on the global and regional stages, than the bipolar strategic environment of the Cold War period. Nascent regional superpowers, ethnic and religious conflicts, and rapidly evolution and proliferation of a number of technologies, have produced an environment more akin to that of a century ago. In this context, strategy and force structure planning become much more challenging problems than during the bipolar Cold War era. Diverse threat capabilities, diverse national and alliance agendas, and unresolved political disputes spanning decades and sometimes centuries, result in an environment of rapid strategic change and resulting complexity. Through the first decade of the twenty first century, Australia's national military strategy was under considerable pressure, with short term ideological and internal political agendas in the Defence Organisation producing unprecedented influence on long term force structure planning. 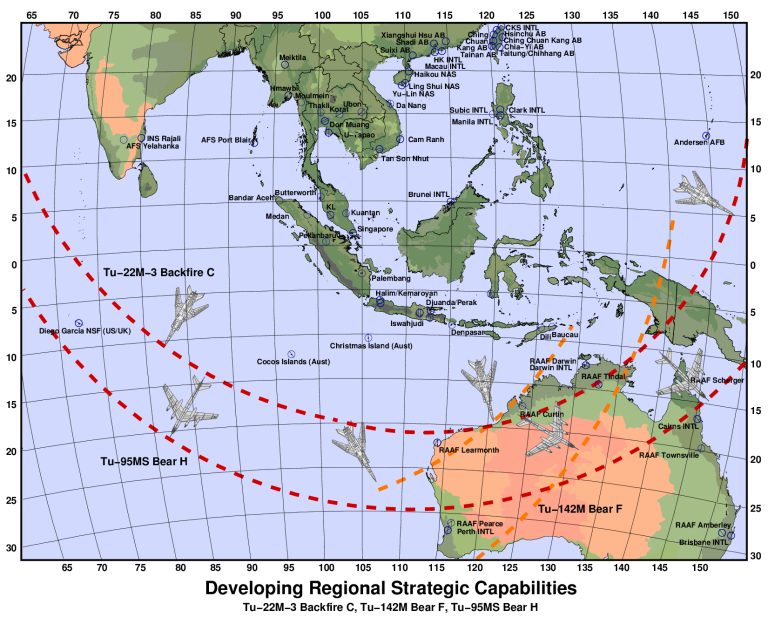 Air power is for reasons of regional geography and technology the backbone of Australian Defence Force capabilities and its development should not be subordinated to the short term needs of other services, or to other agendas. This index provides access to a selection of relevant articles, submissions and papers, dealing with strategy, technological strategy and policy topics. Carlo Kopp Defence Today Dec 2011 Anti-shipping missiles for RAN - requirement or desire? Carlo Kopp Defence Today Sep 2011 COIN reorientation - too far or not far enough? 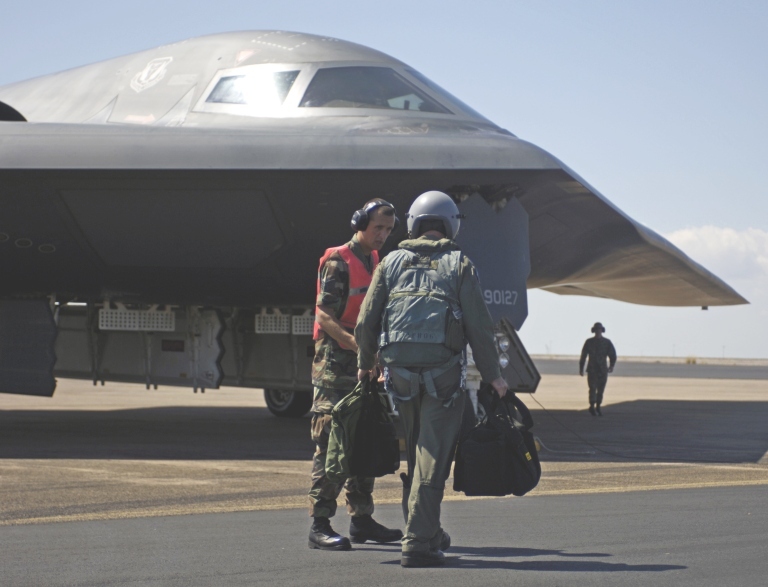 Northrop B-2A - The 70 Billion Dollar Bomber? 1 - Republished from the Winter 2005, Autumn 2007 issues of " Defender", the quarterly national journal of the Australia Defence Association, respectively, with permission. JASDF F-15DJ participating in Exercise Cope Thunder, 2006 (USAF Image). Northrop B-2A Spirit participating in Exercise Green Lightning, at RAAF Darwin. The now certain deployment of strategic bombers, evidenced by development of the H-6K, by the PLA-AF will fundamentally alter the strategic balance in the near region. 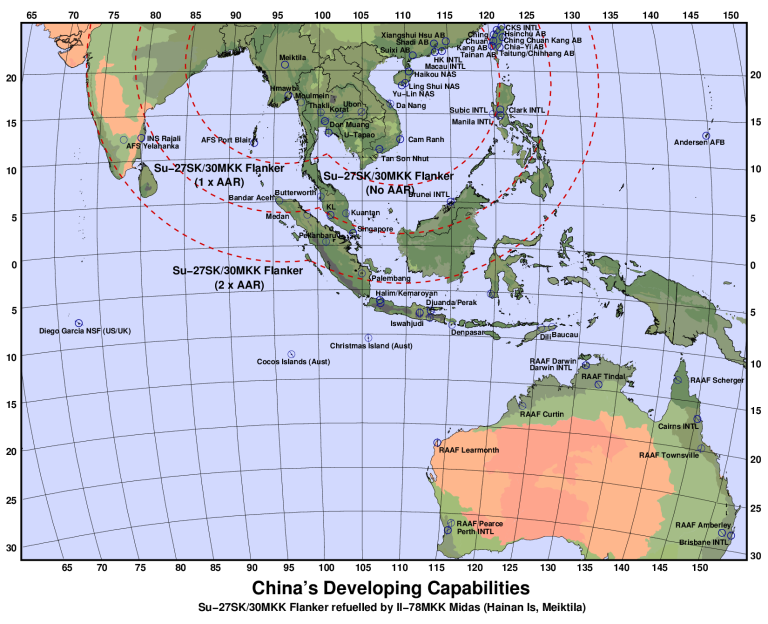 This map illustrates the coverage footprint of the Tu-95MS Bear H and Tu-22M-3 Backfire C flown from southern China and Myanmar basing. The footprint of Indian deployments of like types is included for comparison (C. Kopp). The acquisition of long range Su-27SK/SKM/30MKK fighters and supporting Il-78MKK aerial refuelling tankers provides the PLA-AF with unprecedented reach across the near region (C. Kopp). 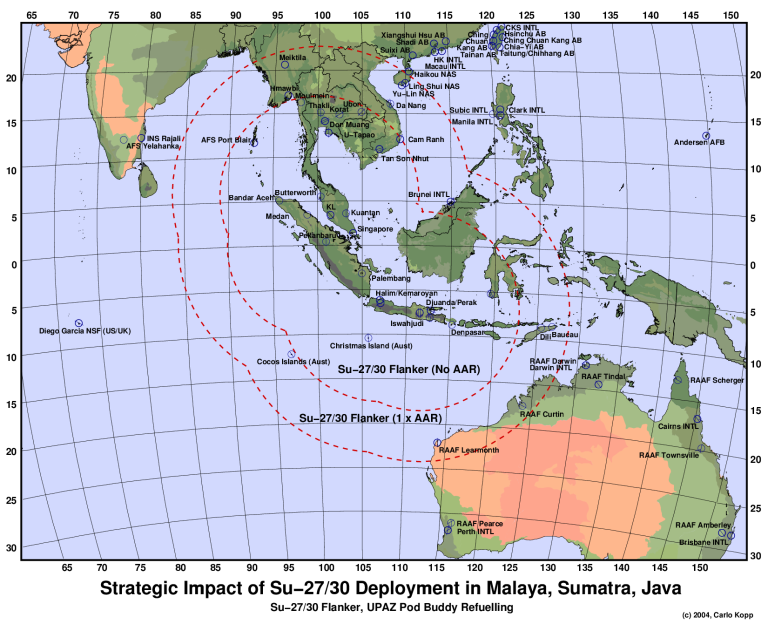 The arrival of the Su-27/30 series fighters in this region changes Australia's strategic context significantly. 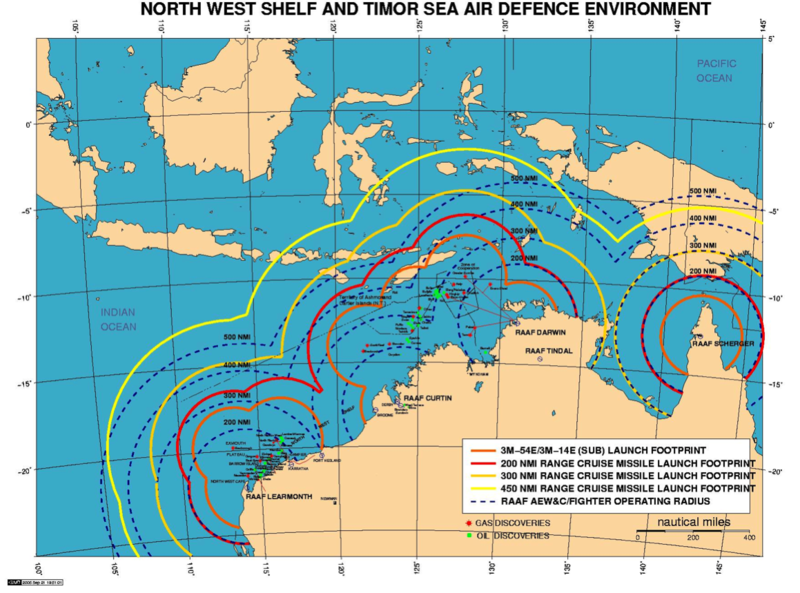 The superb combat radius of these large aircraft provides a significant capability to cover the sea-air gap (Author C. Kopp).